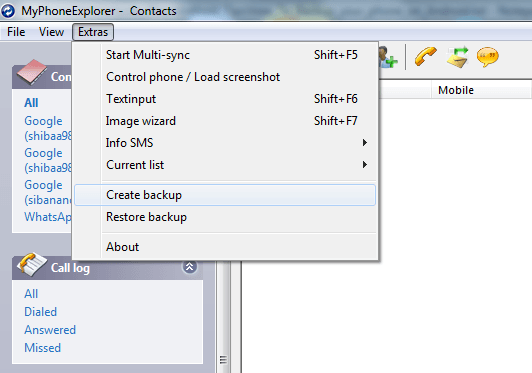 This a very simple Beginner level Step By Step Guide explaining how to take Backup of all the Data on your Android Phone or Tablet such as: Apps, Contacts, Messages, Files etc. on Any Android phone or tablet. Yes, you read it right, this is the one guide which just works on any Android phone whether it be a Samsung, LG or Sony or any Android phone or tablet. No need to install a PC suite for LG, Samsung and Sony differently. This one guide will help you synchronize your data across devices. In our phone we have so many personal data, contacts, important files and many more. Sometimes you get updates for your device, or you may want to restore it to factory settings, or sometimes you may want to upgrade your device to a custom ROM like Cyanogenmod or something else then definitely you will not wish to lose your data at once right!!! 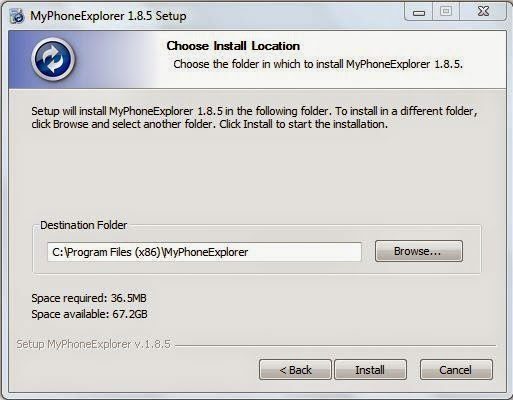 Introducing the MyPhoneExplorer Application which will help you to take backup of all the data on your Android device. Make sure you have at least half an hour of time to set it up and understand properly what it can do for you. This application works on Windows and Linux systems only as far as I know. 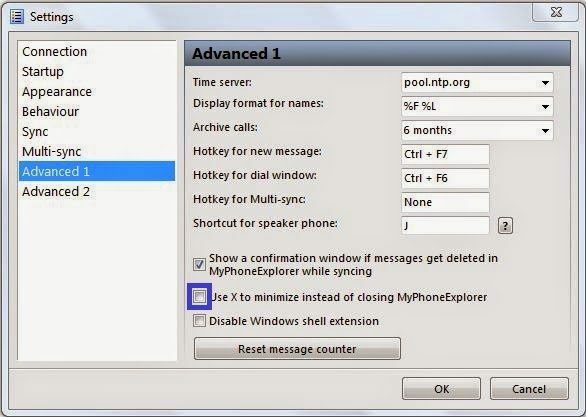 Just follow the below steps to install the MyPhoneExplorer Windows Applicaiton and also the cient App from on your Android Device. This data backup process is only meant for Android devices. To take backup of your data you need to have a Windows or a Linux machine. 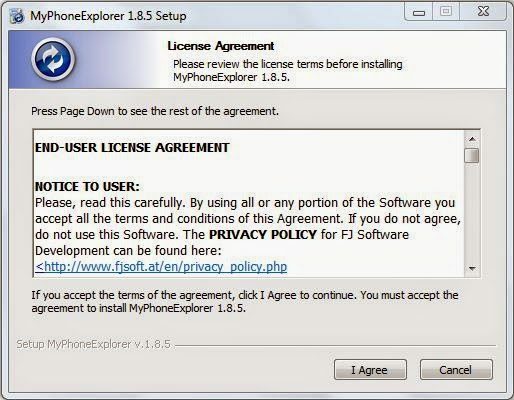 Double click on the downloaded file and agree to the license agreement. Click on I Agree to proceed. 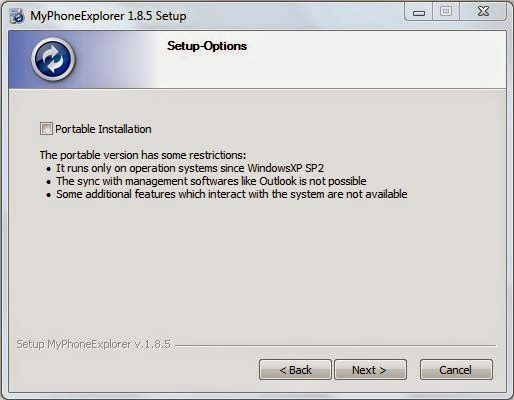 Click on Next and be informed that NOT TO click on the portable installation check box. Select where you want to keep the application files. Better not to change anything and just click on Install. 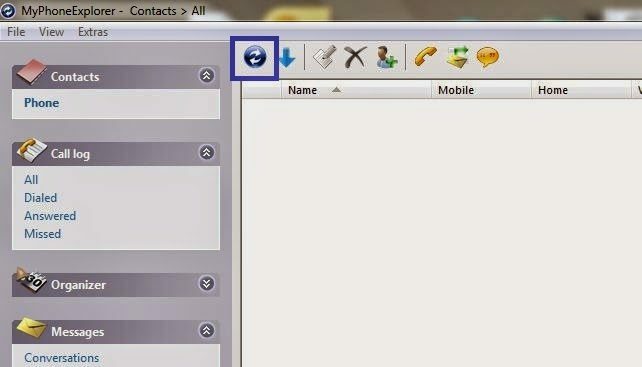 Make sure you run the Client application on your phone before you run the application on your PC and your phone is connected to your PC. I have connected my device to my PC via Wi-Fi connection so It shows that it is “WiFi connected to”. Open File > User > Add user. 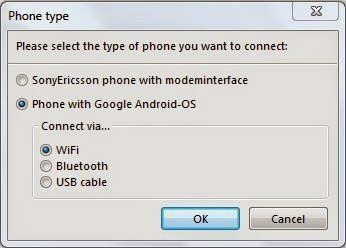 In the next dialog box that pops up select “Phone with Google Android-OS” and select the mode of communication for the “Connect via…” section. As I am connecting my phone to my PC I am selecting WiFi. Before connecting you have to do one more thing. Go to File > Settings and then Go to the Advanced 1 TAB and select the “Use X to minimize instead of closing MyPhoneExplorer” check box. This will now close your application when you will click the close button on your right side. Because if your application is closed then the connection to your device will also be lost. Click on the Synchronise button to start the connection. After synchronization has been completed you can now take a backup of all your contacts, calendar data, messages and your files and even the applications installed. Go to the following path on the application as shown in the below image. You can select the Files and then select a folder where to keep the files on your local computer. Similarly you can select applications and then select a folder on your local machine where you want to keep the Android application files. Now you sit back relaxed till the application takes all the backup of all your phone data. 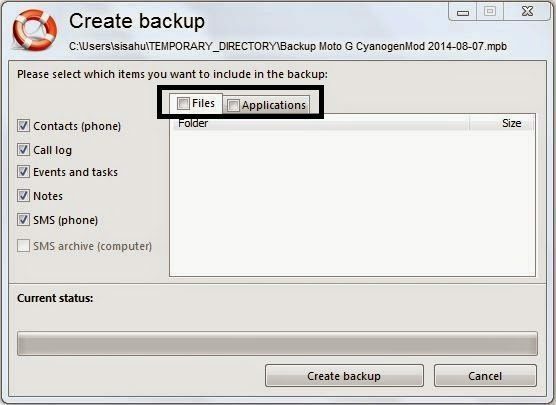 If you want to have a complete backup of the current ROM then you can try the TWRP NANDROID Backup Guide. To backup android phone data to computer, i found Coolmuster Android Assistant also works great, it could transfer android sms,contacts,photos, etc. to pc with ease. What’s more, you can use it to manage the phone data on computer. To backup data from your phone to pc, some professional data backup programs are good choices for you. The MobiKin android file transfer app allows you to save a lot of time to transfer or backup text messages, contacts, photos, and other media files like videos, music files.